I soon settled down to duty at Gloucester. There was 27 single men living at the Station in cubicle bedrooms about 9ft by 7, not much room for accessories and no top to the cubicle whose boards was about 8 ft high and it was nothing to have apple cores, orange rind and sometimes ripe tomatoes arrive on your bed. Of course nobody knew where they came from, the ceiling in the big dormitory was about 15 high but we were a happy crowd. Gloucester City was spread over a large area from the Cross. West the distance was 1½ miles, East 1 mile, South 1 ½ miles and North 2 miles. The beats were split up into Sections, there was always a traffic man on duty at the Cross with an opposite number. We worked hour about at peak periods. August the Ministry counted an average of 94 cars a minute crossing over the cross roads and this was where the Police Officers soon realised that there was good and bad drivers. For instance a motorist would come towards you with an arm out to the right and then go straight on. Well, what could you say, only under your breath when he had gone. I reckon that when I was on day duty I used to average 5 days on of 7 hours duty at the Cross on traffic duty. All weathers you had to stick it, no shelter. of many incidents that I was concerned in. I will try and relate a few. It is said that a Policeman can’t have friends if he is going to be officious and go all out for promotion. Well, that may be so, but I was not gifted that way and soon made friends and some of them were real dear friends. One couple we made friends with in April 1922 remained dear friends until 1964 when the last of the couple died. They were our own age. I hadn’t mentioned that I had married my fiancee from Cheltenham on April 17th 1922 after having saved my £ 100 plus and given the Chief Constable’s sanction. We went to live in 3 rooms in Oxford Street. One of my earliest police experiences was to arrest a friend for being drunk in charge of a motor and for which I’m sorry to say he went to prison for 3 months. That was the end of the friendship for 2 years until he had realised I had only done my duty. So he apologised and we are friends nearly 40 years after the incident. It was about now 1924 that I became very interested in First Aid and a class was formed and encouraged by the late Deputy Chief Constable Mr Hopkins, who gave us time off to be taught competition work and we soon entered competition, but more about that later. A policeman’s life is full ofexperiences, some happy, some sad. 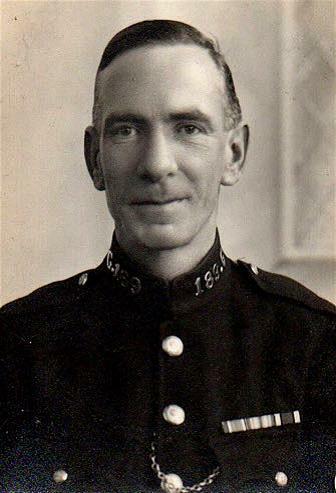 I remember one morning I was having breakfast at the Station with my oId friend Ted Evans ( whom I had joined the Force with) when a clerk (we were allowed ½ hour break from duty for meals) came up from the offices down below to say the Inspector wanted to see us and down we went. He detailed us to take the land wheeled stretcher to collect a man who had hung himself from an apple tree in Hempsted about l l/2mile from the station. We brought him to the mortuary in the city and that was that, back to duty. After I was now transferred to Hopewell Street and sub station in the lower end of the city for duty and it transpired that the Sgt in charge of the sub district was a cousin of mine. Well I don’t think there was any love lost between us from the first although I will say he was every inch a policemen and a good man at his work considering he had 7 men under him, and a populace district. What he said was law but I am afraid we used to play him up a bit. It was here that I found my First Aid useful. An old lady decided to turn on the gas in her bed sitter. The Police were sent for and I went and did the necessary. Dr and Ambulance etc. asked for help which was duly sent. She had wrapped herself in an eiderdown and at first I thought I was to late but I always remember the First Aid saying “better to treat a dead person than to let a live person die”. I applied Artificial Respiration etc. and by now my help had arrived and he relieved me. Eventually we got her heart going and she was taken to hospital where she recovered but she never thanked us in fact she was cross with us for saving her life. The Chief Constable gave me a special commendation in order. night duty with the other men and he was waiting. I knew I had it to come so I got it in first and said to him, “I’m the culprit Sgt” and then he let me have it. I felt very small after he had finished with me and that was that. I can see him now coming down the stairs, candle in hand, and in his nightshirt, to see what all the talking was about when there was 2 of us in to meal break together. There was hundreds of incidents that I could relate about this station but I’m afraid it would take up to much space. I was now transferred back to the Central Station for general duties. I was sorry in one way to leave that district as I had just got to know the people and their ways. 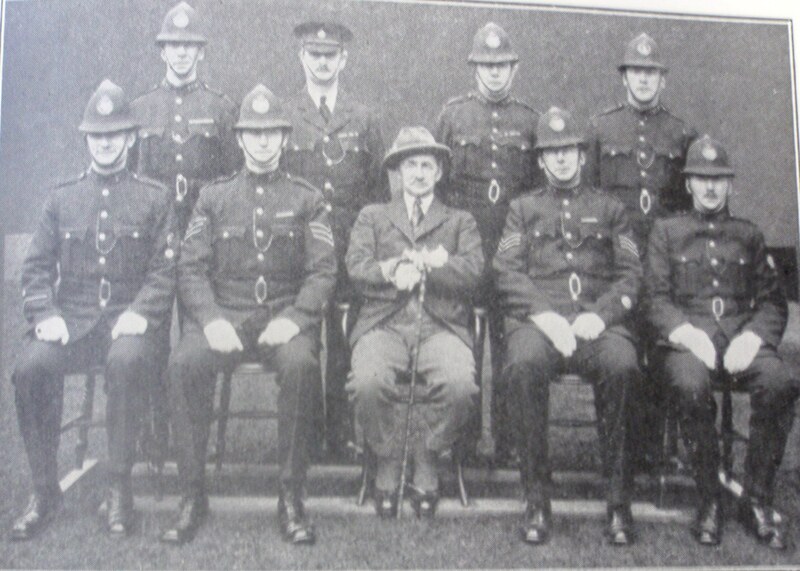 Police Constable L Lodge (Gloucester); Standing first on the left. By now the Chief Constable, Mr Stanley Clarke, had become keen for his Constabulary to form a County First Aid team and I with 5 others were chosen to represent the County at National Competition which meant a lot of time from Police duty to practice for the competition. We travelled to different counties to compete in eliminating competitions for the National Finals in London. We reached the Finals twice and travelled to London. The first time we put up in a hotel in Aldergate for 3 days. The next time a bit posher, we stayed at the Shaftesbury Hotel for 3 days., all expenses paid. The first competition we gained 4th place also the second competition 4th place. These competitions were open to all England and Wales. The last competition we were given a silver cigarette case by the Home Secretary, the Hon. JR. Clyne Esq. In the meantime my married life was progressing. By now I had got a house and 2 sons age 4yr and 1yr, Kenneth and John. I have got about 10 years service in now. I was lucky one night whilst on duty to pick up a burglar at 3am actually in the act, he was an old lag and knew the game but once they are caught right and proper they don’t usually squeal. He got 9 months and I got a commendation. Also a few months later was lucky to recover a gents raincoat 7 minutes after it was reported to me. Another Commendation, but the prisoner was not very helpful but an Inspector was quickly on the spot to give me a hand. I often have a laugh to myself when I think of the following incident. I received information at about 2pm that 2 men were lying on the pavement near the market either dead or drunk. I proceeded to the market and there on the pavement was 2 men and they were helpless. They could have been dead for all they cared. I borrowed a handcart and loaded them onto it and pushed them up through the town to the Central Station where they were locked up. The Doctor was sent for to treat them, they had got drunk on ‘grape wine’ “strong as Cider”. You can imagine the comments I had from passers by on the way to the Station. Such was life in those days.